Diary of a Short Woman » Blog Archive » Ready. Set. Write! Hello! Happy November! And you know what that means…It’s National Novel Writing Month! I’m going “against the rules” this year, and will be working on the NaNo Project that I didn’t finish last year. I’m super excited to see what happens in the story! I encourage everyone to try NaNoWriMo at least once, even if you’re not a writer. I believe everyone has a story itching to get out of them, and writing with the support of a community makes it a little easier. And if you want, you can friend me. 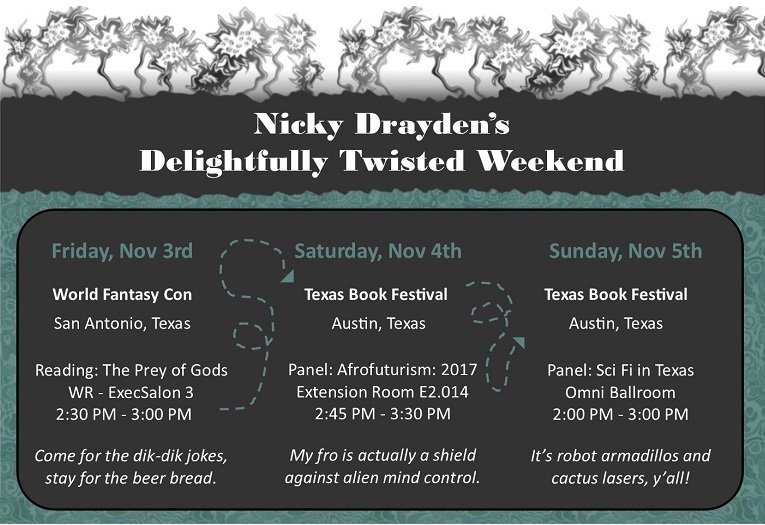 In addition to trying to write a novel this month, I’ll also be doing several conventions, including World Fantasy Con this Friday, and Texas Book Festival this Saturday and Sunday. I’ll also make an appearance at Wizard World Austin ComicCon mid November.